Webpage created: February 06, 2016. The Church of Saint Barnabas. The Anglican Church of Saint Saint Barnabas the Apostle was situated in Stuart Road, Stoke, Devonport. The original Church has been demolished and replaced with a modern but smaller building that also houses a doctor's surgery and community centre. Mrs Lowe, the wife of Admiral A Lowe, laid the foundation stone on Thursday June 11th 1885. Built as a chapel-of-ease to Stoke Damerel Parish Church, it was designed by Mr J Piers Saint Aubyn, architect, of Messrs Saint Aubyn, Wadling and Luff, of London and Devonport. It was to be constructed of limestone with red brick designs and interior facings. There was to be no tower or spire, just a bell turret. Because funds were limited at that time, it was proposed to erect only the western end, with a porch and a temporary roof. That would accommodate 250 people and the contract was awarded to Mr H Gill, of Victoria Place, Stoke, in the sum of £740. A donation of £50 and towards the cost of the Church had been made by the Lord of the Manor, Sir John Saint Aubyn, Bart, MP, who also provided the site, while the Rector of Stoke Damerel, and his wife, had given £200 towards the cost. Admiral Lowe had also given £150. The organist at the initial service, held at the Parish Church, was Mr John Hele and the Reverend J Gilbertson led the service. After that the congregation and guests marched to the site in Stuart Road, where another service was held, this time by the Rector. Opening services were conducted on Sunday March 29th 1886. The Reverend Prebendary Doctor Wilkinson, vicar of Saint Andrew's Church, Plymouth, preached at the morning service and the evening one was taken by the Reverend H Phillpotts, vicar of Lamerton, Devon, while Mr Dugdale presided at the organ. During the afternoon a Sunday schools was formed. Initially there was to be just one service per week, every Friday evening. Saint Barnabas' Church was eventually completed, the work being carried out by Mr Roskelly, of Gunnislake, Cornwall. Externally, the Church was faced with limestone and had window and door jams of Candy's bricks. The nave measured 79 feet 6 inches in length by 51 feet 6 inches in width. It was 33 feet 6 inches high from the floor to the wall plate and 54 feet high to the ridge. It was divided from the aisles by arcades of five bays on each side, with Ham Hill stone piers and brick arches. The north and south aisles were 8 feet 6 inches wide while the chancel measured 36 feet by 20 feet. There were north and south transepts and the vestries were under the chancel. The walls were lined with red bricks, relieved with bands of yellow bricks. The font was of polished Devon marble. The final cost was £6,500 but it could now accommodate 600 worshippers. Although opened on Christmas Day 1893, the consecration service did not take place until St Barnabas Day, Monday June 11th, 1894. Doctor Bickersteth, the Bishop of Exeter, performed the ceremony in the presence of Lord Saint Levan, Mr Piers Saint Aubyn, the Reverend Prebendary W H Saint Aubyn, rector of Stoke Damerel, and a large gathering of the local clergy. Over 200 people attended the free tea held afterwards in the school room. 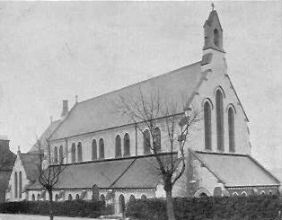 The foundation stone of the Parish Hall was laid on July 24th 1901 and the ecclesiastical parish was formed on November 20th 1904. A Church Hall was opened by Mrs Wodehouse on January 8th 1908. The Sunday School attached to St Barnabas' Church was taken over from February 21st 1917 by pupils displaced from Paradise Road Elementary School, which had been handed over to the military authorities for use as a temporary hospital during the Great War. A full congregation on Wednesday June 11th 1919 witnessed the dedication of three memorial windows and the memorial to those parishioners lost in the Great War. The final service in the original Church was held at 7.3pm on June 11th 2002. The Church was demolished and on the site has been erected a block of 32 flats for the elderly, named St Barnabas Court. Funded jointly by the now defunct Housing Corporation, Plymouth City Council and the Sarsen Housing Association, the building was constructed by Messrs Kier Western. Part of the ground to the east of the old Church has been turned into a community garden and enables the new, smaller, Saint Barnabas Church to be seen from the main road. The new Church was officially opened by the Bishop of Plymouth, the Right Reverend John Garton, on Wednesday November 26th 2003. The Great War memorial tablet and another commemorating Mr John Helson, who invented a depth charge release mechanism for destroyers, are preserved in the new Church.